What are you doing Thursday night? Why not join us for the kickoff of the NFL season opener at 8:30 pm EST on NBC. It’s the Pittsburgh Steelers versus the New England Patriots and as if you couldn’t tell yet, I’m a diehard Pittsburgh Steelers fan along with my entire family. Even though we’re living in Ohio now, our roots are in Pittsburgh and as all Stiller fans know, it’s in our blood. Our apologies to the Bengals and Browns, it’s simply impossible for us to be converted. 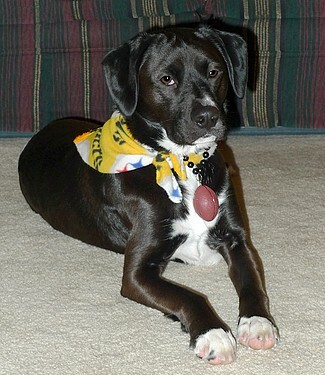 Of course, that also means Haley is a Steelers fan. Nobody tackles the Steelers football better than her and nobody rushes to the game day feasting faster than her. 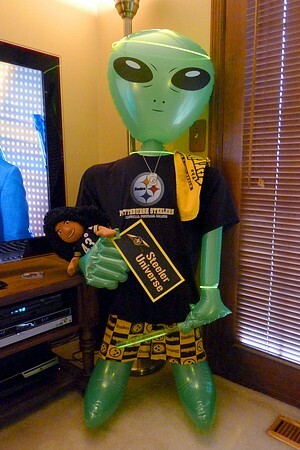 She loves our Steeler football parties. She anxiously awaits the ritual of putting on her black and gold bandana then she heads to the front window to wait for the guests to arrive. She’s definitely a dog ready for some football! Most of the members of our Pittsburgh Steeler family! 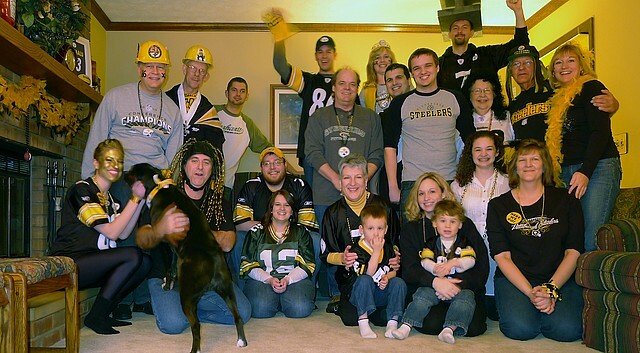 With four generations of Steeler fans gathering on game day, things can get a little rowdy as you can imagine and when the entire family shows up, it’s quite a crowd. For some dogs, football parties can be a bit overwhelming. There’s lots of people moving around and talking, multiple TVs blaring the game action, full plates of food carried at nose level, random howls of protests when refs make bad calls and sudden eruptions of cheers and high-fives when those amazing interceptions and touchdowns seem to materialize out of nowhere. That’s a lot of noise and excitement for a dog. I’m hoping we can get everyone together in one picture this season! Our game day festivities last much longer than the game itself because there’s lots of catching up to do with family members. It’s not unusual for a party to go into overtime, lasting 6-8 hours or longer. By the end of the get-together, Haley’s ready for some serious napping. I read somewhere that it’s not uncommon for dog bites to occur at the end of a long party. That makes sense because dogs can get overloaded, tired and a bit grumpy just like people. When you take into account that dogs need almost twice as much sleep as we do, they’re going to be pretty exhausted towards the end of the party, especially if they’re like Haley and hang around the kitchen for pre-game food preparations then spend most of the game socializing with fellow fans. So, I thought I would offer a few tips for keeping your pup safe and avoiding those yellow penalty flags being thrown against her during your football game party this season. If your dog gets overwhelmed by excessive audibles or celebration, consider keeping her in a quiet room, crate or have a friend watch her for a few hours. Colleen wins best dressed family member! Select safe, razzle-dazzle decorations if your dog likes to chew on things that might be left laying around. If your dog tends to get overly excited when people come to your house, exercise her 30 minutes or so before your guests are scheduled to arrive. If you’re like me and you’re rushing around up to the last minute, call upon your special teams unit. Most family members and friends are happy to help out. If your dog is a jumper like Troy Polamalu, put her on a leash until she calms down so she’s not tackling everyone as they come through the door. Be sure to keep any food that’s harmful to dogs away from where they can easily intercept it. Also inform your guests if you prefer they don’t complete any passes of snacks to your pup. Watch the alcoholic beverages to make sure nobody goes out of bounds and offers some to your dog. If your dog has a habit of raiding the trashcan, keep a close eye on it and any plates of food that might be left laying around, especially those appetizers with toothpicks. Also, be ready to detect any dangerous food that might have been fumbled on the kitchen gridiron. If you suit up your dog for game day, try to keep it simple and make sure they’re comfortable wearing their uniform. Some dogs aren’t fans of wearing clothes or accessories and it could add to their party stress. If your dog is a relentless beggar looking for handoffs, keeping her on a leash will give you more control. Keep a close eye on your pup if there are young kids running around. 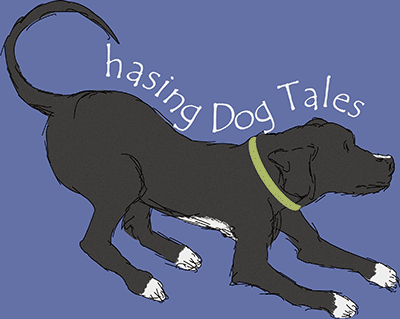 A playful dog can accidentally sack a young child and some dogs might snap or bite if a child pulls their ears or accidentally steps on their tail. If you’re at all concerned about how your dog interacts with children, it’s better to put the dog in a crate or quiet room. Make sure your dog can breakaway and escape to a safe place if she feels scared, threatened or overwhelmed. Gain some yardage at halftime by taking your dog outside for a short break or walk. Your pup will surely appreciate a timeout from the commotion and noise. Sometimes it’s hard to tell when a dog is tired or over-stimulated. If your dog doesn’t mind being away from you and your guests, give her some time on the bench by putting her in a quiet room to relax. With a lot of people coming and going, watch for signs that your dog might blitz through an open door. Some guests might not be good blockers and they might not even notice that she broke through the line of scrimmage. Even hosts need some time to sit down and enjoy the game. I always take time to huddle with Haley on the floor. She gets a short belly rub to keep her relaxed before it’s time to get back into the game. Keep checking in with your dog. Sometimes they get nervous when separated from their family members, especially if they’re protective or insecure. This is one time that you don’t want your team member going into the red zone. Almost all of these tips involve playing good defense by keeping a close eye on your dog and being watchful of their body language. It’s pretty easy to get distracted when hosting a party, so enlist your family or friends to help out and remember that it’s your role to protect your dog and make sure she’s comfortable. It’s almost kickoff time! 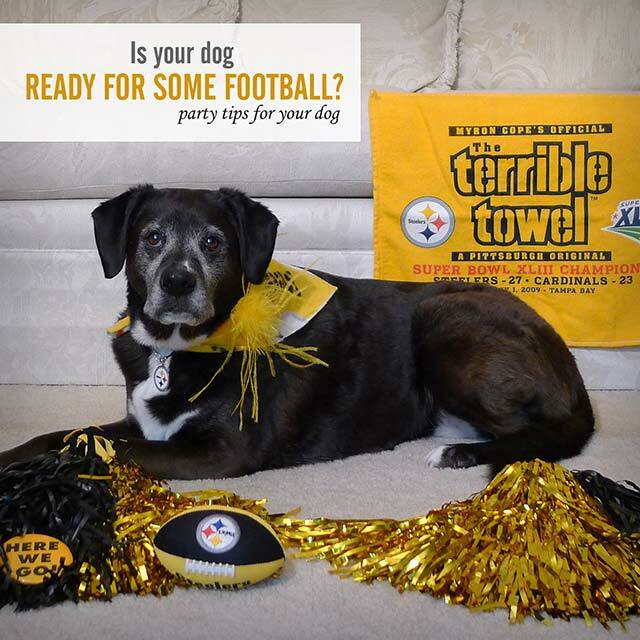 Is your dog ready for some football? I’d love to hear your tips for keeping your dog safe and comfortable during football games or large parties. 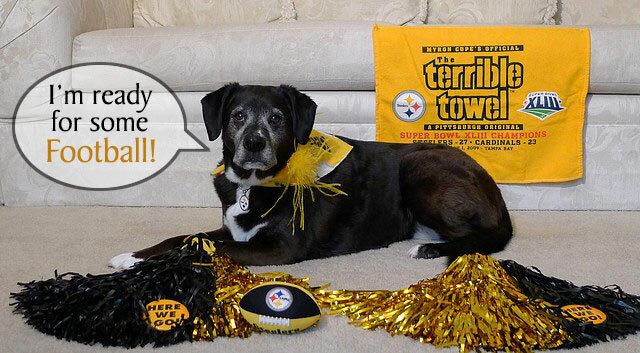 My Humans told me Ohio is right next door, just across the river from Pittsburgh…so y’all “Go Steelers”. Bet there’s lots of Steelers steelin’ around Ohio besides y’all! Have fun! Go Steelers! 🙂 Yes, there are plenty of Pittsburgh fans here in Ohio so we’re definitely not alone, haha! Some great tips, we really aren’t football fans. Have a great season! Thanks, JoAnn. We’re hoping they have a great season too! Football isn’t as big here in Canada and I’m not much of a fan myself but interesting read. Plus that photo is too cute! When it comes to playing sports, Haley’s more of a basketball player. But when it comes to game day parties and snacks, she’s all about football, haha! Great tips for keeping your dog safe and feeling secure on game day. Since there can be lots of noise and activity (strangers and loud cheering can be confusing and stressful), and opportunities for dogs to eat things they shouldn’t, as you point out, a little prevention goes a long way to make the day fun and exciting for everyone! Yes, Go Bucks! I hope they get off to a great season this year too. ? We’re not football fans here, hehe! We’re not big football fans here but Mr. N watches soccer with us sometimes… He does not approve of yelling at the screen though! Mr. N’s in good company with all the soccer fans out there. ? Lol. We are HUGE Browns and Buckeye fans here! Can’t wait for the real season to begin! Great advise!! We are Green bay fans, even though we live in 49r territory since Aaron Rogers is a local boy!! I like Green Bay too and one of their biggest fans is front and center in one of the pictures. She earned the right to be there since Green Bay had just beat the Steelers in the Superbowl when the picture was taken. She was pretty brave to come and watch the game with us since she was the only Green Bay fan. At least one person in the room was happy when the game was over, lol! Aw, I bet they both looked cute in their jerseys! Great tips! We are not big football fans here, but baseball and hockey, oh heck yea! Hockey’s fun to watch if you have a bigger TV to follow the puck, lol! We usually catch a few of the Penguin games when we can. Honey is very jealous of Harley. 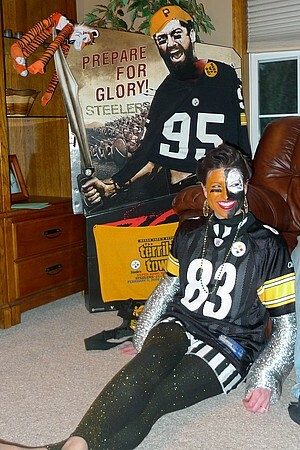 Your Steelers parties sound like something she would love. I wish you lived closer and Honey could come to one of our games. Haley loves it when family members bring their dogs. It adds another level of entertainment to the party. What a fun post, I love your wild photos! Woo Hoo!! 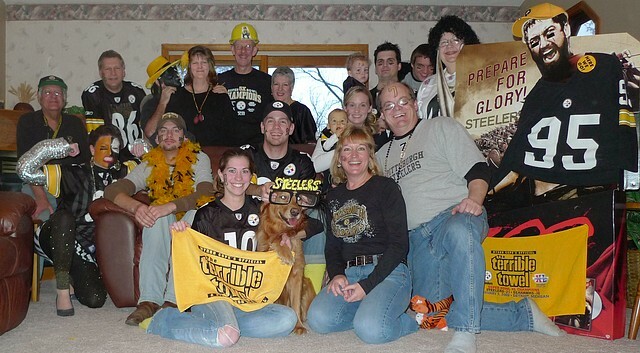 I’ve learned that no matter where a Steeler fan moves to, it’s always “Steeler Country” to them – I admire the loyalty! Thanks, Cathy! Our games are always fun whether they win or lose. For most of us, it’s more about getting together and socializing then the final score of the game. ? Those are all great tips and very similar to the ones we have in place to help keep our dogs and guests safe. We rarely have big parties (although we have hosted a Super Bowl or two) but Holidays tend to be held at our house. I know the dogs love having everyone over, but after a few hours it does get to be too much for them. Sampson will pretty much find a quiet spot, but if there is food, there is no way Delilah is going anywhere, so I have to be watchful. One SB party we had people sitting on the couch typically used by the dogs and you should have seen Sampson stare this guy down for sitting in his spot. LOL He’s also known for climbing up on the couch and squishing himself between two people. Lol, I can imagine Sampson staring at your guest because he was in “his spot”! And yes, the holiday parties are probably just as chaotic for dogs, especially if there are guests staying in the house. Wow you and your family are serious football fans! Looks like you have a really fun family reunion around the game. We’re not into football ourselves, but we used to throw huge Super Bowl parties years ago that were more about the party than the game. 🙂 That was “BD” – Before Daisy. I never really thought about the stress that long parties can cause dogs, so this was really enlightening for me. Great tips. Thanks so much, I appreciate your kind words. Jodi brought up a great point in her comment about holiday parties and how dogs can get a little tired or overwhelmed around that time of year too. I’m usually so busy with everything there is to do around the holidays, sometimes I forget that Haley’s not getting as much rest or downtime either. I’ve never hosted a football party (since I myself am not big into sports) but I love going to them. It’s one of those rare opportunities for us adults to get together and have some extra fun. I’m always a bit jealous that I can’t seem to get into the game as much as others, but it’s still a great time. Laika’s still pretty excitable when we have guests over, but her overbearing affectionate please pet me begging works on everyone – which just encourages her more.. It’s embarrassing for me when I look over and see her slowly crawling up onto a guests lap as they pet her – but luckily my friends are a bunch of dog lover and they take it in great stride. It didn’t take too long, maybe a season, before Ace got used to the yelling. Now he hangs out and “watches” the games with us, although sometimes he gives Josh a look, like, what is the big deal? Another thing that used to freak Ace out was the sound of the whistle in basketball games or the high-pitched squeak the players’ shoes make on the court. He got over that too without us doing anything, but he used to run out of the room to “hide” from that too. It’s got to be confusing for those people that don’t normally have game day guests, then suddenly have a large Superbowl type of party. Luckily Ace and Haley know the routine, including occasional screaming at the refs, lol!